But how do you get in on the seasonal game? We asked the experts and came back with these suggestions. Eat’n Park’s head of purchasing, whose official title is Director of Sourcing & Sustainability, blogs about farms and farmers. Unit chefs from Big Bowl prowl their local farmers’ markets, ready to buy. And Farmers & Fishers, in Washington, DC, is actually co-owned by the North Dakota Farmers’ Union, along with its sister restaurant Founding Farmers. Welcome to the new menu reality, where the words “seasonal menu change” don’t just mean switching out stews for salads and cappuccino for iced coffee. The ingredients themselves have become fresh, seasonal and—just as often—locally sourced. Customers demand it, chefs want to do it. Stay flexible, and use specials to showcase seasonal ingredients. “Our chefs have to be at least a little ambiguous when it comes to writing the menu,” says Big Bowl’s Bernard, “so they can take advantage of what’s in season.” Build-your-own stir-fry bars in every location, which drive anywhere from 10 to 20 percent of sales, allow for a lot of flexibility. And it’s no coincidence that customers delight in seeing what’s going to be on the bar at any given time. 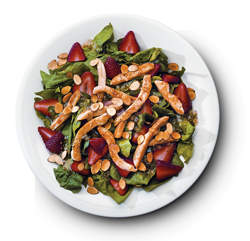 At the same time, Big Bowl unit chefs are not only empowered but encouraged to feature any of their finds as a special on base recipes, such as sugar snap peas and snow peas in the Shrimp and Tea Smoked Pork, or strawberries in a drink special. Seek out vendors with expertise in seasonal. “We have customers who essentially take CSAs from us, and use their twice-weekly shipments of produce to inspire their daily menus,” says Chris Neary, executive chef for J. Kings, a Holtsville, NY-based distributor that has made a niche for itself by specializing in produce from Long Island, upstate New York and Northern New Jersey. Neary is referring to Community Supported Agriculture, a game-changing concept that essentially sells shares of a farm’s upcoming harvest to produce-hungry customers. For its part, J. King’s provides its corporate customers with a variety of resources, including recipe ideas, weekly produce reports, point of sale merchandising materials and even farm bios to help operators “romance” the story. Be willing to become the middleman between your distributor and local farmers. “When we started converting inventory to local farm-raised produce in season, I had to meet with growers to find out what they could provide and work with distributors to convince them to carry the products,” says Jamie Moore, who was very early to the party when he started the FarmSource program in 2002 for Eat’n Park Hospitality, which consists of the Eat’n Park family restaurant chain and other foodservice companies. Volume of operations in specific markets helped, too, of course, but Moore recalls virtually having to create a new organization in order to begin serving things like local tomatoes and fresh peach salsa in season. Start planning early. Even as flexibility is a virtue when working with seasonal products, a restaurant with any volume at all also needs to take a disciplined approach. “If you have a 40-seat restaurant and charge $30 a plate, you can make money on anything,” says Dan Simons of VSAG, the consulting company that manages both Founding Farmers and Farmers & Fishers, two large, approachably priced farm-to-table restaurants in Washington, DC. “But when you’re selling entrees for $18 it’s not a good business model to say, ‘Here’s a great bushel of peaches, let’s make a salad.’” With a menu that changes six times a year, Simon’s crew works off a 52-week farm calendar that shows a conservative estimate for when any given ingredient might be available, then works backward from there to plot the timing of new menu item rollouts. Simons also fits in as many of the puzzle pieces ahead of time, even testing an item with out-of-season product. Get to know your local farmers. Chefs aren’t spotted at the local farmer’s markets only to buy; they’re there to establish relationships and meet potential purveyors, says Harvest Sensation’s Gullikson, a former restaurant chef who spent years cooking in the classical French style, from farm-to-table. “Many farmers do local programming with distributors, and they’re at the farmer’s market just as a side business. You can get to know their product and their philosophy, and what they’re willing to do—some are just too quirky or don’t have the resources or room to have a truck come to their farm.” Then, too, the larger markets are also a hive of activity for distributors, and operators can develop relationships with them as well. In addition, take advantage of cross-promotional opportunities with suppliers. “Farmers and breeders also sell to the public, and they may also have marketing efforts.” Using their logos, tapping into any of their publicity activities and staging events like a Dinner with the Farmer are all valuable tactics.